It was a Victorian clean sweep of the podium in the 2019 Load 28 / Bonetti Transport and Hire South Australian AMCA National Championship at the Murray Machining and Sheds Murray Bridge Speedway on Saturday February 9 as Darren McCarthy led home Dean Heseltine and Tim Reidy in the 30-lap finale. After starting from position 1, after highest points scorer Jake Armstrong elected to start on the outside, McCarthy paced the field for the entire journey and didn’t put a wheel wrong as he survived multiple restarts to reclaim the title he had previously held. The battle for second came right down to the final lap as Heseltine, who was the defending South Australian Champion, got the better of Reidy to claim the runner-up position. Former Australian Champion Jeremy Moore was best of the locals as he fought back from being sent to the rear for a racing incident to claim fourth with Frank Thierry (Victoria) completing the top 5. Alan Saint was the last of the drivers to complete the entire 30 lap distance in sixth. Kelsey Allen and Travis Litterini were the final two drivers to greet the chequered flag a lap down on the race winner. After running second early in the race the night came to an early end for the top qualifier Armstrong as his car caught fire bringing on the red light. Earlier six heats were conducted for the 17 drivers in attendance with the opening two rounds being a straight up front and rear draw with the final round sending the higher qualified drivers to the rear. The heat winners included McCarthy, Lachie Gwynne, Moore, Shane Cartwright (NSW), Reidy and Armstrong. The night also saw events for the Wingless Sprints, Late Models, Modlites and Street Stocks. 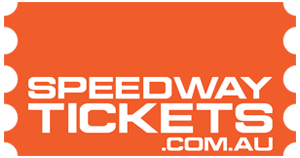 In the Wingless Sprints Joel Chadwick took home his fourth consecutive Murray Bridge Speedway main event as he defeated Joel Heinrich and Matthew Kennedy. The Late Model feature proved to be a great race as Mat Crimmins held out Mark McCarthy in a great finish while Brook Alexander won the Modlite finale over Justin Chadwick and Nathan Launer. In the final category it was Sam Brumfield who edged out Nigel Reichstein by less than .3 of a second in what was a great duel to end what was an entertaining “Sportsman Night”. 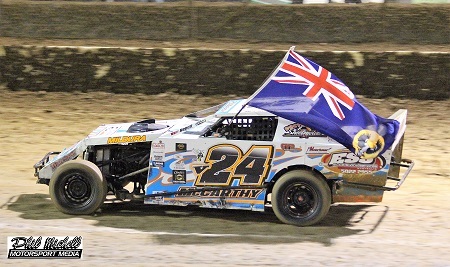 The next meeting at the Murray Machining and Sheds Murray Bridge Speedway will be on February 23 with a predominantly Sedan based program with Super Sedans, Street Stocks, Junior Sedans, Modlites, Formula 500’s and AMCA Nationals.